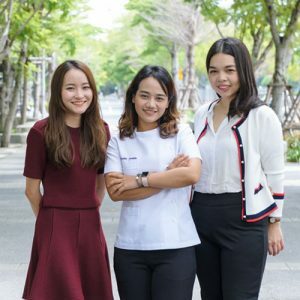 Three alumni from Mahidol University International College (MUIC) have recently graduated from the Faculty of Dentistry of Mahidol University. Dr. Busara Chaveerungtaveesup, Dr. Kodchaporn Mongkollikit, and Dr. Wichatchaporn Swangvong all obtained a bachelor’s degree in Biomedical Science in 2012. This year, they joined the graduation ceremony as full-fledged dentists. Proud as they are for being able to reach their dreams, they also look back at how MUIC prepared them to achieve their success. They have embarked on their new career: Dr. Busara works at Tassara Dental Center on Sukhumvit Road in Bangkok; Dr. Wichatchaporn is now connected with the Royal Thai Police Hospital, also in Bangkok; while Dr. Kodchaporn holds clinic at Modern Smile Dental Clinic in Pattaya and Sriracha, both in Chonburi Province. Among the three, Dr. Busara is the one whose mind has been set on pursuing a career in dentistry at the beginning. She enrolled in MUIC knowing the strength of its science programs and its use of English as the medium of instruction. “I was lucky to have graduated from MUIC. The science courses that I have taken—mammalian physiology, functional histology, chemistry and biology, for instance—prepared me for dentistry school. MUIC also offers liberal arts courses that gave me a new insight about other areas of studies like psychology, geology, Southeast Asian history, philosophy and many more. So for me, MUIC is no doubt one of the best universities in Thailand,” Dr. Busara said. According to Dr. Kodchaporn, MUIC trained her on how to manage her responsibilities well, from simple things like taking care of her study plan to arranging her own class schedules, thus preparing her for the more rigorous demands of dentistry school.